Three years of Resolutions about change. It started in 2006, the year we launched ChangeEverything.ca. We began what would become an annual tradition: our Viva la resolution! contest where anyone could come to the site, name the change they want to make about themselves, the community or the world and blog about that change at least three times. The winners would be selected partly by user selection and partly by the moderator, Kate. 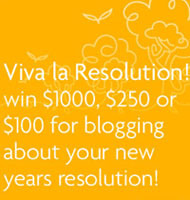 The three top choices would receive a Vancity Visa Gift Card worth either $1,000, $500 or $250. It has generated some great content for the site over the years, including the truly amazing EnviroWoman and her pledge to live plastic-free. So this year, we’re doing it again! If there’s a change you’re interested in making, come to this site by February 28th and dig in! I’m nominated for a Best of 604. 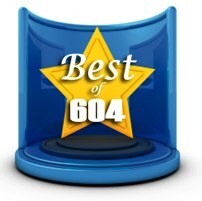 So evidently I’ve been nominated for a Best of 604 Award in the Best Personal Site or Blog category. Also, ChangeEverything.ca has been nominated in the Best Group Blog or Multi-Author Site category. If you have a second, and it really only takes a second, please consider voting for azaroff.com here and for ChangeEverything.ca here. Also, hat tip to Tony, a friend from elementary and high school whom I’m now connected to on Facebook for letting me know. Thanks Tony! Interview with me on NACUSO blog. I had a great conversation this week with Jim Jerving who is a primary writer for the NACUSO blog (National Association of Credit Union Service Organizations). We chatted about a whole host of ways that credit unions can use social media to open conversations between and among their employees and their members. Today he published some of what we spoke about on his blog in a post titled The Groundswell: Credit Unions Develop Online Communities. It’s nice to see such a good conversation turn into such a good blog post. …be the catalyst for instituting collaboration, innovation, and the reinvention of the Credit Union industry. Posts like this get to the very heart of that purpose.